Platycerium coronarium (J.Koenig ex O.F.Müll.) Desv. Platycerium coronarium (J.Koenig ex O.F.Müll.) Desv., Prodr. : 213. 1827; C.Chr., Bot. Tidsskr. 32: 349. 1916; Tardieu & C.Chr., Fl. Indo-Chine 7(2): 445. 1941; Holttum, Rev. Fl. Malaya ed. 1, 2: 138, f. 57. 1955 [‘1954’]; Tagawa & K.Iwats., SouthE. Asian Stud. 3(3): 75. 1965; Hennipman & Roos, Verh. Kon. Ned. Akad. 80: 92, f. 20e–h & 21. 1982; Tagawa & K.Iwats., Fl. Thailand 3: 489. 1989; Hennipman & Roos, Fl. Males., Ser. II, Ferns and Fern Allies 3: 138. 1998; Boonkerd & Pollawatn, Pterid. Thailand: 257, 283. 2000; Dy Phon, Dictionary of Plants used in Cambodia: 504. 2000; Newman et al., Checkl. Vasc. Pl. Lao PDR: 30. 2007; Leti et al., Fl. Photogr. Cambodge 559. 2013. – Osmunda coronaria J.Koenig ex O.F.Müll., Naturforscher (Halle) 21: 107, f. 3; 1785. – Type: Plate 3 in Müller, 1785 (the fertile frond only). Acrostichum biforme Sw., Schrad. J. Bot. 1800 (2): 11. 1801, pl. 11:2. 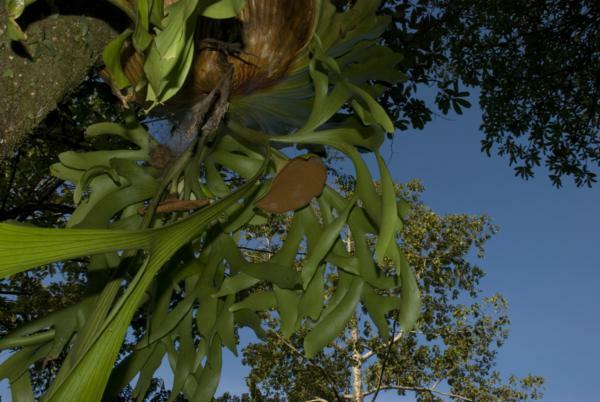 – Platycerium biforme (Sw.) Blume, Fl. Javae Fil. 14, t. 18. 1829; Bedd., Handb. Ferns Brit. India: 445, f. 173. 1883; Christ, Bot. Tidsskr. 24: 105. 1901. Rhizome short creeping, more than 1 cm diam., fleshy, covered with scales at apex; scales broad, 15–35 by 4–10 mm, brown, herbaceous. Fronds strongly dimorphic with nest leaves and fertile fronds. Nest leaves 40–110 cm by 25–55, dichotomously lobed, the deepest sinus more than 20 cm deep, the lobes round at apex, about 5 cm in both length and width or longer; main veins raised on both surfaces, dichotomous, smaller veins copiously anastomosing, invisible; very thick, up to 1.5 cm thick and fleshy at base. Fertile fronds 50–125(–200) cm long, pendulous, several times dichotomously branching, lower branch unequal, bearing short sterile branches and a single, simple fertile lobe, upper branching almost equal; ultimate segments narrowly subtriangular, not pointed, entire, main veins dichotomous, raised, smaller veins hardly visible, forming copious network; fertile lobes stalked, almost circular to deeply cordate, up to 15 cm broad, the whole concave lower surface covered with a dense felt of stellate hairs and sporangia . NORTH-EASTERN: Nong Khai; SOUTH-EASTERN: Chon Buri, Trat; PENINSULAR: Phuket, Krabi, Trang, Satun, Yala. Burma (Tenasserim), Vietnam, Cambodia and N & W Malesia. Epiphytic on trunk of larger trees in open places at low altitudes, rather common.